Aaron Zachery (A. Z.) Sinsheimer was born in 1838 in Burstadt, province of Daerstadt, Germany, the son of Simon and Chana Sinsheimer. Two of his brothers, Bernard (1848) and Henry (1854), were born in Burstadt, to Simon Sinsheimer’s second wife Carolena. A. Z. Sinsheimer came to the United States in 1845 and was naturalized in 1860. He served in the Union Army as a quartermaster during the Civil War. He was captured and imprisoned by the Confederate forces at Camp Ford in Texas for eleven months, in 1865. Sinsheimer married Jeanette “Nettie” Weil in 1865, whom he had been courting before the war. The couple first lived in New York. In 1870, they family to Vicksburg, Mississippi to be in the cotton business. In 1878, A.Z. Sinsheimer’s business was destroyed by fire. His brother-in-law, Oscar Weil, immediately offered him a position in San Francisco, a place to live in his home, and financing to start a new business. A.Z. 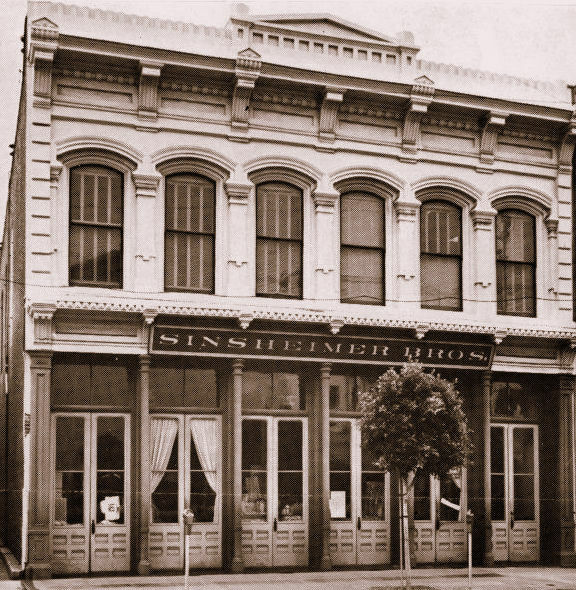 Sinsheimer instead decided to settle in San Luis Obispo, where his brothers, Bernhard and Henry Sinsheimer, had a large general merchandise business, Sinsheimer Bros.
A.Z. began as an employee of the firm. In 1884, the Sinsheimers purchased a lot on the east side of Monterey Street at Rose Alley, where they built a brick store that was 40-feet wide, 100-feet in deep, and adorned with an iron front. Today, the Sinsheimer Building is regarded as one of the best-preserved iron-front structures in the United States. 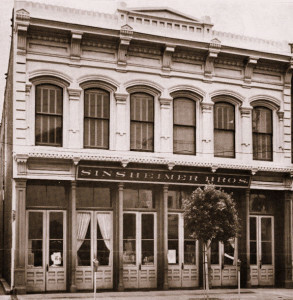 In 1898, Bernhard and Henry Sinsheimer ended their partnership of Sinsheimer Bros. Bernhard moved to San Francisco. The successor firm was incorporated with the same name, Sinsheimer Bros., with A.Z. Sinsheimer and his family in full control. A.Z. Sinsheimer also began accumulating substantial land holdings in the area including the Gibson Ranch, Irish Hills Ranch, Los Osos Ranch, See Canyon Ranch, Little Avila Ranch, and Lomita Ranch. The Jewish community of San Luis Obispo was recognized as early as 1870. “The Hebrews of San Luis Obispo celebrated their New Year on Monday and Tuesday this week. All their stores were closed, and it appeared as though the life of the town was gone. We were never so much impressed with the weight of this class of our fellow citizens. 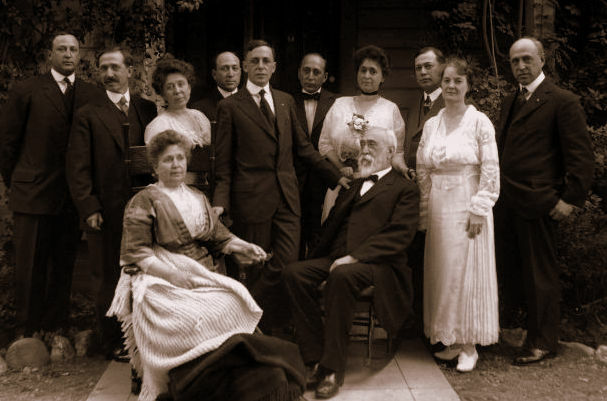 Nettie Sinsheimer was one of the founders of the Jewish Sabbath School and, for a long time, its superintendent. A. Z. Sinsheimer served as a City Councilman and on the San Luis Obispo School Board. He was appointed to the County Board of Supervisors, specializing in the Probation Committee for Delinquent Children. A.Z. Sinsheimer married Jeanette “Nettie” Weil in 1865. Their two older sons were born in New York City: Samuel (b. 1867) and Louis (b. 1869). Sinsheimer Elementary School in San Luis Obispo is named after Louis, who was mayor of the city for nearly 20 years. Four more children were born while they lived in Vicksburg: Gertrude (b. 1871), May (b. 1873), Sidney (b. 1875), and Otto (b. 1877). Four additional children were born in San Luis Obispo: Paul (b. 1879), Fern (b. 1881), Irving (b. 1883), and Warren (b. 1885). In 1898, Jeanette Sinsheimer organized and was first president of the San Luis Obispo chapter of the American Red Cross. 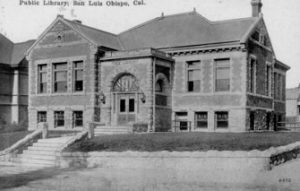 She was instrumental in having a Carnegie Library established in San Luis Obispo in 1904. She was also the county chairman of The Women’s Board of the Panama-Pacific International Exposition in San Francisco in 1914. In 1915, A.Z. and Nettie Sinsheimer celebrated their Golden Anniversary – thirty-seven of which had been in San Luis Obispo. A.Z. 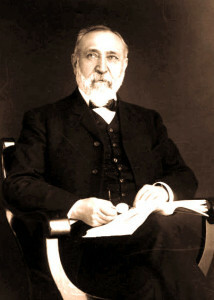 Sinsheimer passed away in 1919. All the businesses of San Luis Obispo closed between 11:00 am and 1:00 pm in honor of his passing on the day of his funeral. Jeanette “Nettie” Sinsheimer passed away in 1926. David Epstein is curator of this Aaron & Jeanette Sinsheimer exhibit. Thanks to David Yudain for additional information.